A lot of people around me are in complete awe of Murakami’s books. Norwegian Wood has been sitting in my bookcase for years, but somehow I still haven’t read it. As multiple people recommended “Kafka on the shore” to me I thought it was time to buy it and read it. Am I as in awe as the others? Find out below! 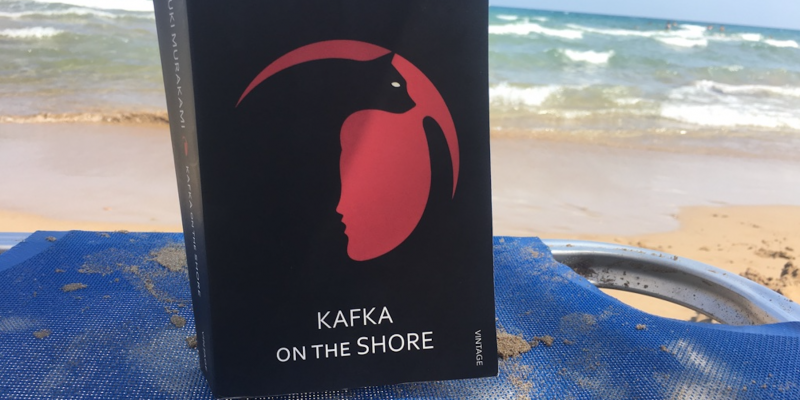 Kafka on the Shore is powered by two remarkable characters. At fifteen, Kafka Tamura runs away from home, either to escape a gruesome oedipal prophecy or to search for his long-missing mother and sister. And the aging Nakata, who never recovered from a wartime affliction, finds his highly simplified life suddenly upset. Their odyssey, as mysterious to us as it is to them, is enriched throughout by vivid accomplices and mesmerizing events. Cats and people carry on conversations, a ghostlike pimp employs a Hegel-quoting prostitute, a forest harbors soldiers apparently unaged since World War II, and rainstorms of fish fall from the sky. There is a brutal murder, with the identity of both victim and perpetrator a riddle. Yet this, like everything else, is eventually answered, just as the entwined destinies of Kafka and Nakata are gradually revealed, with one escaping his fate entirely and the other given a fresh start on his own. The book switches chapters between the self-named Kafka and Nakata. Kafka is a 15 year old runaway and Nakata is an old man who lost his memory as a kid. Nakata cannot read or hold any memories, but he can talk to cats. Kafka winds up working in a library where he befriends Oshima and gets to know Ms. Saeki. Soon, wild theories emerge as the story continues, filled with metaphors and metaphysical experiences. Nakata has to leave as well, he doesn’t know exactly where or why, but he knows it as soon as he sees it. He befriends a lorry driver, Mr Hoshino, who helps him reach that destination. The book centers on Kafka’s exploration and Nakata and Hoshino’s travels. I didn’t like all the parts of the story, but admittedly I don’t think I fully understand all of the story. Mostly because some questions remain unanswered, but perhaps these can be unravelled by a second read, as Murakami himself suggests. It is a surrealistic book that leaves you with a feeling of wonder and completion at the same time. I loved the ending of the book, it made the story a necessity for Kafka to enter a much needed same but brand new world. It is obvious that Murakami is a brilliant writer and a very intelligent one too. I am enthusiastic about the book, but perhaps not as much as the people who recommended it. Without a doubt, I will read more books from Murakami and I would certainly recommend this book. To tell you the truth, I may even read it again to fully grasp all the metaphors and connections in the book.